Being diagnosed with a chronic disease such as cancer is overwhelming. Ultimately it can be one of the scariest experiences in your life. Processing your own mortality is stressful and you’re immediately faced with a long list of decisions. These decisions encompass both treatments and lifestyle changes you may need to make. By making these decisions you are taking responsibility for your health and embarking on a journey that is both difficult and rewarding. What is driving my disease? What prevents my body from healing? What will help me heal as an individual? Once you know what is driving your disease, what has caused it and what is stopping your body from healing then you can choose the most suitable treatment. No guesswork and no hoping for a miracles. To find the root cause of your disease we need to investigate your current health state, your inherit strengths and weaknesses and check the 5 major causes of disease. Toxins are all around us, in the air we breathe, the water we drink and food we eat. However not everyone is toxic. This is because everyone has a different capacity to detoxify. This is regulated by our liver function, our antioxidant production, our kidney function, our digestive system and the lifestyle habits that support detoxification (water, fibre and exercise). Although pathology testing for toxins is in some cases essential, some toxins cannot accurately be tested for while others are very costly to test. Ultimately the investigation into toxicity begins with investigating any lifestyle habits that may have lead to toxic ramifications. Some common toxin exposure routes are receiving dental work, professions working with solvents, cleaning agents, areoles, paints, petrochemicals and pesticides. When we do find toxins we gently support liver and kidney detoxification, bowel elimination, appropriate hydration, and circulation. This will always be beneficial. We focus detoxification on those toxins which are most likely causing your problem and are indicated by your symptoms. However detoxification involving binders and over stimulating the liver, can in fact be more harmful as it can lead to an increase in intermediate metabolites (toxins produced by the liver) and deficiencies as binders inhibit the absorption of nutrients. Therefore the detoxification process must always be gentle, consistent and is most effective if you know which toxins you need to target specifically. What causes a deficiency? The common saying “You are what you eat” does come in here. Without proper nutrition you will begin developing deficiencies. However you also need to investigate “You are what you absorb”, “You are what you metabolize”. The cause of deficiencies can be linked to every system in the body and finding the cause of deficiency must always delve deeper than an assessment of dietary intake. As an example, the consumption of tap water containing fluoride displaces iodine within the body and can lead to iodine deficiency. Another common cause of a zinc mineral deficiency is the lack or blockage of stomach acid. When we take an ant-acid or have low stomach acidity (HCL) we are effectively blocking our absorption of zinc. Infections are a part of life. Every day we are infected by a plethora of bacteria, virus, fungi and more. Each day the immune system analyses these pathogens and decides how to react. When we are young the exposure of these pathogens quite literally teaches our immune system how to act. Through the course of this we also develop our micro biome (the host of trillions of bacteria, protozoa, fungi, yeast and virus’s that live in harmony within our gastrointestinal system, many of our mucus membranes and skin). The balances of these bacteria have a tremendous effect on our immune system and are vital for the function of out gastrointestinal, hepatic and nervous systems. Although the definition of acute is generally short term, even acute infections such as tonsillitis have long lasting effects on our entire system. For example, when children who have had a tonsillectomy are at higher risk of developing an autoimmune conditions, some cancers, allergic reactions, respiratory issues and infectious diseases. This is because the tonsils are a major hotspot of immune cells that analyze everything that pass into the gastrointestinal system and lungs. When removing these the immune system is not able to detect pathogens as quickly and the immune reactions may be delayed. This increased risk is most likely compounded by the fact that a large percentage of tonsillitis patients are primarily treated with antibiotic treatment although tonsillitis is causes 70%-85% by a viral infection. Therefore antibiotic use simply damages the gut’s micro biome weakening the immune system even further. Chronic infections are as Epstein Barr, Lyme, Ross River, Hepatitis, HIV, CMV are persistent infections and therefore reside within your body for years or forever waiting for the opportunity to replicate and grow. These opportunistic style infections can have disastrous effects on almost every system in the body and often testing for these is the only way of finding out if these may be a factor. However alongside these viral infections and bacterial infections, chronic gastrointestinal dysbiosis can also have severe consequences. For instance, spore forming bacteria stimulate the colon’s mucosal lining to release 5HT which is the precursor for serotonin. In fact up to 90% of the body’s serotonin (Neurotransmitter linked to happiness) is produced in the gut. Therefore Depression may be linked to an infection of the wrong gut bacteria. Another example would be that an overgrowth/infection of bacteria in the small intestine (SIBO) which causes bloating and a host of other digestive complaints can also lead to the opening of the tight junctions leading to a condition called Intestinal permeability or leaky gut. This leads to inflammation within the liver and increases the risk to a long list of diseases. Once we have investigated and found which infections are contributing your heath state we implement therapies, which help you reduce the pathogenic load, boost the immune system and support the detoxification pathways. Treatment is mostly done slowly and gently enabling the body time to heal. There is no doubt that our diet and lifestyle contribute to our physical and physiological wellbeing. In fact the according to Bruce Lipton our environment has a greater impact on our body than the genetics we are born with. Fortunately this is the one component of the health that many patients are aware of and begin to make changes in. However when you are immersed within your own story it is often difficult to accurately assess your own habits and see self-destructive tendencies. This is where seeking the help of a third party can be so important. What is considered a wrong and or damaging habit? All patients have questions. Should I be eating more protein or fewer carbohydrates? Is sodium laureth sulfate safe? Are cooled potato’s good? Do I need a reverse osmosis filter? The information we receive from the Internet and many other sources is filled with contradictions and can leaver you confused and sometimes to scared to make any changes. Therefore once again seeking the help of a professional is going to be your best choice. Guiding you through this maze is what a good coach and health professional should do. Guidance and clarity that you need and it’s our job to provide that. Two-thirds of all clinic visits to family physicians are due to stress-related symptoms. 43% of adults suffer adverse health effects from stress 40% of workers reported their job was very or extremely stressful. So we can safely say that stress plays a massive role on our health wellbeing and disease outcomes. Stress not only impacts our psychological state but it directly impacts a neurotransmitter and hormonal cascade which has far reaching effects to every system in our body. In fact the success of any treatment can be hindered or the efficacy reduced by persistent stress. Therefore when we are confronted with a chronic disease we must look at how we can best manage stress. If this Stress is not avoidable we need to see how we can enable the body to cope with stress better. Our adrenal function and perception of stress can be altered by use of lifestyle changes, cognitive therapy or supplements. Sometimes even genes affect our stress responses. For example; catechol methyltransferase (COMT) is a genetic mutation that affects some people’s ability to efficiently break down adrenaline, noradrenaline and dopamine. This means that people who have this COMT mutation are unable to calm down after a stressful event as easily as people without this mutation. In the management of this mutation it is important to avoid any foods that can further block COMT activity. Epigallocatechin gallate (EGCG) and Quercetin are two common polyphenols that can further block COMT activity, therefore the avoidance of supplements containing these ingredients is required. Magnesium on the other hand stimulates COMT activity. Therefore patients who have the COMT mutation may require a specific magnesium supplement to support this genes function. We’re all individual, we all have unique reasons for our condition, so lets start having unique treatments for each person. To help you overcome disease we have decided to offer our expertise in the form of a consultation. We asks all the right questions so that we can determine the best possible plan of action, find the best treatments and decide on the best possible supplementation and diet for your needs. 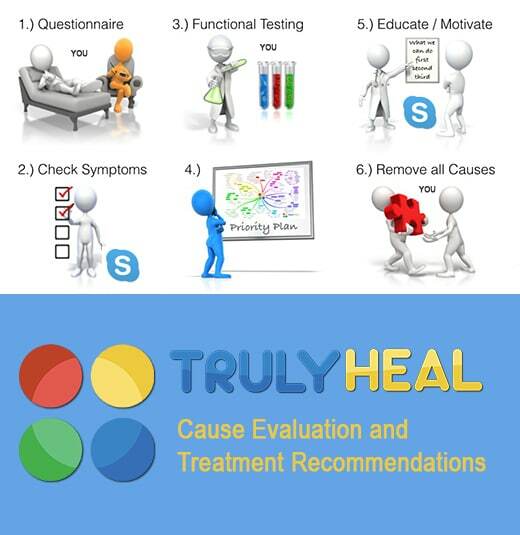 The Truly Heal Evaluation will help you pinpoint the cause of your disease and provides you with the information you need to move forward. It’s like getting a road map back to health. Book your consultation here. And be quick. We have only a limited number available each month. Thank you Benedict I found this information excellent and well written. I am a Radical Remission Workshop Facilitator. Very interesting read! Great article Benedict!